Hello and welcome to CricketCountry's coverage of Match 23 in which three-time champions CSK host two-time winners KKR. EASY PEASY! 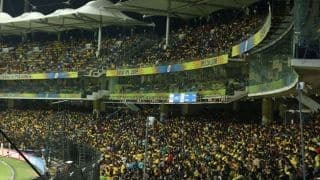 Chennai Super Kings romp home after beating Kolkata Knight Riders by seven wickets. With that, they register their fifth win of the season and consolidate their position at the top of the rankings. Faf du Plessis smacked back-to-back boundaries off Harry Gurney and Sunil Narine gives away 5 WIDES to ensure CSK’s win. End of Over 15: OUT! Rayudu falls for 21. Two balls after surviving a dropped catch by Prasidh Krishna, Rayudu skies Chawla to Nitish Rana after he top edges a slog sweep. Perhaps he lost patience taking the singles. None the less CSK are 85 for 3, but it may be too late for KKR. Kedar Jadhav off the mark with a boundary. End of Over 14: CSK 77 for 2. Just 32 needed off 36 and unless something dramatic is in store, CSK should coast home. They have eight wickets in hand. KKR need a miracle, perhaps a hat-trick. And even then it may not be enough to win the game. The battle of the table-toppers might just go CSK’s way. End of Over 13: There’s turn so CSK aren’t really pushing the panic button just yet. Chawla gives away five runs off his third. The required rate is just a shade over 5 and CSK are doing just that at the moment. CSK 73 for 2, need another 36 off 42. End of Over 12: CSK 68 for 2 after Narine gives five in his third over. 41 needed off 48. The partnership between Rayudu and du Plessis has reached 33 off 43 balls. End of Over 11: Faf du Plessis, WOW! Sweeps a fuller delivery from Kuldeep and even the lightning quick Andre Russell can’t get to it. CSK motoring along nicely at 63 for 2. End of Over 10: Second boundary from Rayudu. Easy picking from him. CSK making steady progress to reach 57 for 2, not doing anything flashy and concentrating more on rotating the strike. End of Over 9: Beautifully bowled from Kuldeep. The spinners have tied CSK down. Three tight overs in a row to keep the score to 49 for 2 as the strategic time-out is taken. 60 needed off the final 11 overs. End of Over 8: KKR going for the full monty. Kuldeep from one end and Chawla from the other. Two of their best spinners operating in tandem. CSK 46 for 2. End of Over 7: Tight from Kuldeep in his first over. CSK 43 for 2. End of Over 6: CSK 40/2 in Powerplay. Little blip from Prasidh, who oversteps and Rayudu hits him through midwicket to cash in on a free hit. End of Over 5: OUT! Narine strikes again. Raina goes for 14. The left-hander went for the heave and Piyush Chawla takes a stunning catch near deep midwicket to send Raina back. CSK 35 for 2. End of Over 4: Having gotten off the mark with a SIX, Raina goes inside out over covers to collect his first boundary. CSK steady at 33 for 1. End of Over 3: Oh and there’s the wicket! Sunil Narine has Shane Watson for the eighth time in the IPL. Watson started the over with a crunching backfoot push for a boundary but hit a pull shot straight to Piyush Chawla at square leg. New man Suresh Raina is off the mark with a SIX to take CSK to 25 for 1. End of Over 2: A comparatively better over from Prasidh Krishna. Just a couple of singles as CSK move to 14 without loss. End of Over 1: A four to start the innings and a SIX to follow it. Watson off the blocks taking it to Chawla in the opening over of the innings. CSK 12 for 0. If there was one man who could get KKR out of the rut, it was Andre Russell. And guess what, he did it again. He takes 14 off the final over to help KKR limp to 108 for 9. 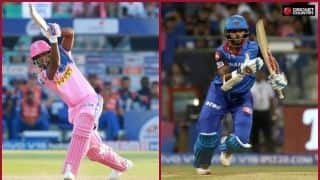 Playing with an injured arm, Russell smoked a six and a murderous pull shot which Ambati Rayudu made a mess of at deep square leg. Final ball, Russell caps off the innings with another boundary. He finishes on 50 off 44. Take out his contribution and you’ll understand where KKR would have been. End of Over 19: Russell connects and gets a SIX, but that’s it. Furthermore, CSK deny Russell a single off the final delivery, which means that Harry Gurney will be on strike. A wonderful spell from Chahar comes to an end. He finishes with 3 for 20, quite a stand-out performance. KKR 93 for 9. One over remains. End of Over 18: Eight runs of the over. A boundary from Russell, but otherwise no more boundary-hitting shots. After refusing two singles, he takes one off the penultimate ball of the innings. Harry Gurney plays out the final ball. KKR 87 for 9. End of Over 17: It’s madness for KKR. Wickets falling in a heap and Russell devoid of the strike. Jadeja takes out Prasidh Krishna as KKR slump to 79 for 9. Thankfully for KKR, Russell finally has strike. End of Over 16: OUT! Chawla goes. Harbhajan picks up his second. Easiest of stumping for the captain Dhoni. Chawla chips down the ground and is beaten with the flight. Dhoni has ages to take the bails off. Nice little partnership comes to an end. Next ball, it goes from bad to worse for KKR as Russell, trying to rotate strike scampers for the single and Kuldeep is RUN OUT. KKR 77 for 8. How much more can they get? All hopes pinned on Russell. End of Over 15: KKR 75 for 6. This has been a stead partnership between Russell and Chawla – currently going at 28 off 29. Good review taken by Tahir against Russell but turn took the ball went past the off stump. End of Over 14: A wonderful piece of fielding at deep square leg saves CSK five four runs. Russell took the aerial route to Scott Kuggeleijn before Jadeja times his dive well and saved a SIX. Russell however connected better off the fifth ball to pick up a boundary. KKR 70 for 6. End of Over 13: Harbhajan drops Russell! Oh dear, that is not a batsman you’d want to drop. Russell goes for the big hoick off Tahir but all he managed was a top edge. Harbhajan at midwicket makes a mess of it. The home crowd cannot believe it. Will this turn out to be a costly drop. Meanwhile, Piyush Chawla smacks a SIX over deep midwicket. KKR 63 for 6. End of Over 12: SIX! Russell is up and running. Smokes a SIX off Harbhajan over long-on. He probably has not other option. KKR 56 for 6. End of Over 11: GONE! They’re running through KKR now. Tahir foxes Shubman Gill with the googly and MS Dhoni does the stumping work with ease. Gill doesn’t even both getting his feet back. KKR’s lowest score in the IPL in 67. They’re 49 for 6 here. A dejected KKR owner watches from the stands. End of Over 10: Half way through the innings and KKR move to 47 for five after Jadeja gives away just three in his third. End of Over 9: Oh dear! Just as we said it. Imran Tahir strikes in his first over. 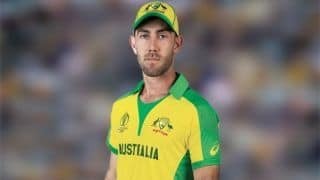 He gets the big wicket of Dinesh Karthik. KK slump to 44 for 5, not even 50. This is not the way they’ve played the IPL so far. Tries to whip the ball towards leg but Harbhajan takes a sharp catch at short midwicket. The BIG MAN Andre Russelli is out in the middle. CSK couldn’t have hoped for a better scenario for dre Russ to have walked out into. End of Over 8: Harbhajan resumes and keeps the batsmen on their toes. Just four singles to keep KKR to 37 for 4. Karthik and Shubhman Gill need to stitch a partnership. It’s 13 at the moment at less than a run a ball, and although it’s not the quickest, KKR need to ensure they do not lose another wicket anytime soon. End of Over 7: Scott Kuggeleijn into the attack and he starts off with a tidy over. A double and two singles. KKR 33 for 2. End of Over 6: Jadeja races through his over as usual. KKR 29 for 4 at the end of the Powerplay after Dinesh Karthik helps himself to a second boundary. KKR’s four wickets are the most wickets to have fallen in a Powerplay this IPL season. End of Over 5: Deepak Chahar strikes again. Having begun the over conceding back-to-back boundaries, he gets Robin Uthappa out caught at deep midwicket. Uthappa cracked a cover drive and a pull, before a second pull led to his dismissal. He didn’t middle it as we as he’d have liked to and Kedar Jadhav takes it comfortably. KKR 24 for 4 and in plenty of trouble. End of Over 4: First over without a wicket. Karthik, the skipper is off the mark with a streaky boundary. Cuts Ravindra Jadeja but the ball flies off the edge past slips. KKR 16 for 3. End of Over 3: Make that three in three. KKR, what are you doing? Rana tries to whip Chahar on the leg side but pushes the ball straight to Ambati Rayudu, who plucks a sharp catch at leg gully. Fine field placement. KKR 9 for 3. End of Over 2: Two in two for CSK as Harbhajan Singh takes out Sunil Narine. He goes for the slog but Harbhajan was able to fix him just about enough to ensure Narine didn’t time it well. Top edge and a fabulous running catch from Chahar. Early strikes leave KKR at 8 for 2. End of Over 1: Great start for CSK. Deepak Chahar strikes early and Chris Lynn is on his way back. Pitches in line and straightens to hit Lynn flush in front of the stumps. Sunil Narine meanwhile is off the mark with 5 – a single and 4 overthrows. KKR 6 for 1. And we’re underway. The umpires and CSK are making their way onto the field. KKR’s tried and tested opening pair of Sunil Narine and Chris Lynn are striding out as well. They put on 91 in 8.2 overs in the previous game. Can they do it again against a formidable CSK bowling unit? Let’s find out. Deepak Chahar has the ball as usual. Dinesh Karthik: We would have bowled first as well due to the dew factor. But now that we’re batting first, need to put runs on the board. Yes, the bowlers practise it a lot but it’s not easy at all. We’re unchanged. 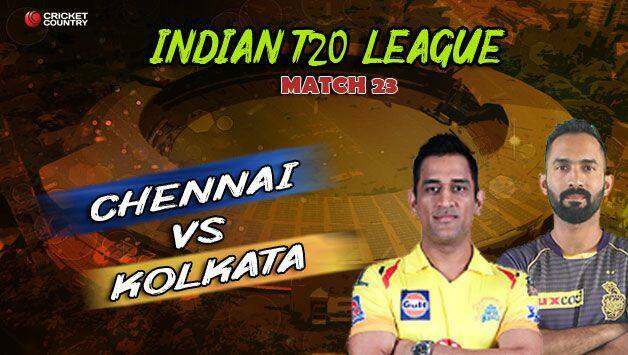 TOSS: Chennai Super Kings opt to bowl against KKR after MS Dhoni wins toss. Both teams remain unchanged. Hello and welcome to CricketCountry‘s coverage of Match 23 in which three-time champions Chennai Super Kings host two-time winners Kolkata Knight Riders. TOSS coming up shortly. A cursory glance at the points table and you would feel that both Chennai Super Kings and Kolkata Knight Riders are on equal footing with just the net-run rate drawing a wedge between them. To an extent they are. But take a closer look and the differences are quite visible. While KKR look a deadly combo of youth and old, CSK have continued to put their faith on veterans who against all odds deliveries them a third title last season. In terms of strength, the common thread between the two sides is their spinners. If KKR boast of Kuldeep Yadav, Sunil Narine and Piyush Chawla, CSK have Harbhajan Singh, Imran Tahir and Ravindra Jadeja. 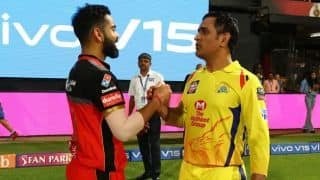 Their meeting in Match 23 of the ongoing Indian Premier League (IPL) could very well turn out to be a battle of spinners with the Chennai pitch favouring the slow bowlers from day one.